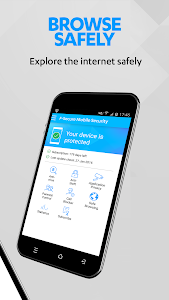 F-Secure Mobile Security for Smartphone & Tablet - TRY IT NOW FOR FREE. No ads! Easy-to-use. From F-Secure, the award-winning cyber security company with over 30 years' experience of protecting millions of users and companies around the world. 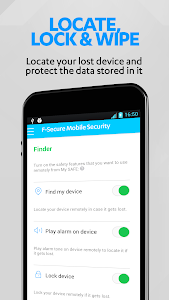 With this app you can protect your smartphone or tablet, and the personal content on it. 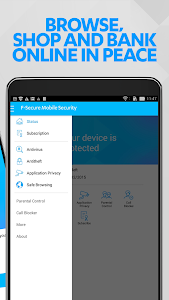 Banking protection, browsing protection, parental control, app scanning, and more. With antivirus and web browsing protection, you’re protected against viruses, spyware, hacker attacks and online identity theft. 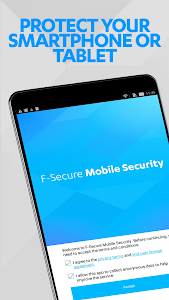 With F-Secure Mobile Security, you can browse, shop and bank online in peace. 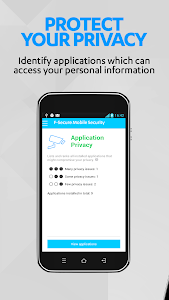 It also protects you from malicious apps by showing you which apps on your device are a risk to your privacy. Safe browsing works only when you are browsing the Internet with Safe Browser. 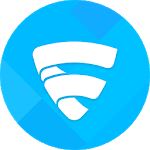 To easily allow you to set Safe Browser as default browser, we install this as an additional icon in the launcher. This also helps a child launch the Safe Browser more intuitively. 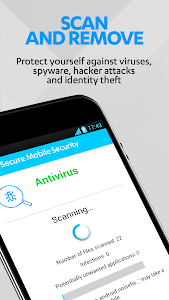 Similar to "F-Secure Mobile Security"